I must admit the title of this one has always seemed a bit clunky. But what else to call it? Those three models are the star of the book, of course, but there’s plenty more here. Until the launch of the V and the Explorer in ’58, electric guitars were supposed to look like … guitars. Suddenly, Gibson turned conventional design on its head, using straight lines and angular body shapes. In the process, Gibson changed the way electrics could look, and that’s the main story here. 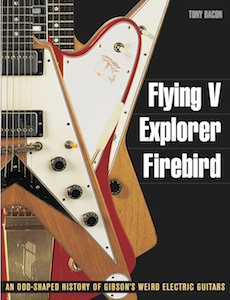 I tell the story of the original commercial failure of the V and Explorer, Gibson’s later attempt at a similar style with the Firebird, and then the subsequent influence of these designs on makers such as Hamer, Jackson, Dean, Ibanez, B.C. Rich, and ESP, who all in their different ways endorsed Gibson’s original take on the idea of weird-is-good. I also spoke to a good number of players to get their view from the land of weird, and the book features exclusive interviews with Andy Powell, Rick Nielsen, KK Downing, Billy Gibbons, Gus G., Michael Schenker, Phil Manzanera, Johnny Winter, Alexi Laiho, and others. You can read a short extract from my interview with Rick Nielsen if you click on the link here. If it’s pointy and it has strings, you’ll have a good chance of finding it in Flying V, Explorer, Firebird.